thanks, confirmed I can now register which is great.. I was scratching my head for some time until i came across your setup guide, this little setup step was all I was lacking, thank you very much for posting! It took me less than an hour to get up and running. Also - thanks for running the cloud controller for the AP's. Awesome guide you have here. I was wondering if you have any any experience with the UniFi Secure Gateways? specifically the Pro. I currently have Vodafone Fibre and I will be switching to Bigpipe tomorrow and I can not for the life of me get it working. @NZVengeance Vodafone Fibre (not to be confused with FibreX which is not even fibre, it is damn Cable) is PPPoE over VLAN 10. You need to have the PPPoE details as these are per user however you should be able to pull that out of your existing router. Any opinion on using the USG (Security Gateway) vs. the EdgeRouter? If you're Vodafone FibreX (Cable) then it is DHCP over VLAN 10. IcI: Hi. Any opinion on using the USG (Security Gateway) vs. the EdgeRouter? Regards. I've done a few installs with the USG and it is a great product - more suited towards beginners. It is essentially the Edgerouter but all management is done via the UniFi controller (and is far more basic). @michaelmurfy, thanks for the guide. Thanks @stubbed - yes, I did provide feedback to Ubiquiti regarding the hardware offload and it does appear they've fixed some of the bugs in my guide. Add me to the list of people who are now set up on ERLs. Thanks heaps @michaelmurfy Set up was a breeze with your guide. 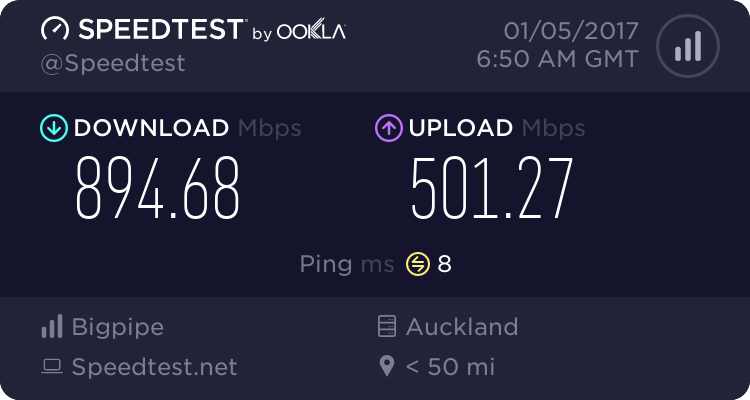 I'm still only on ADSL (via a Vigor 120 in bridge mode), but I'm ready for fibre when it eventually arrives. Also, I can now re-purpose (hopefully) my Netgear WNDR 3700 as a 5GHz wireless bridge to our kitchen stereo - which struggles on built inb 2.4 GHz, due to the proximity of our microwave. Next step on the ERL, is to set up all the dns4me DNSMASQ etc stuff, that I had running (through Gargoyle) on the Netgear. For those interested in more Ubiquiti / UniFi info, Willie Howe has a YouTube channel covering many topics. I need help with logging errors (or messages) from an ERL 3 (running 1.9.1). I have started Log Center on a Synology DS216Play running the latest version of DSM. I cannot see any messages from the ERL to the Log Center. I did try the Kiwi Syslog program with the same results. I have turned on logging on my Draytek Vigor 130 and I get messages e.g. Logon, Informational. I don't get any message from the ERL. Log to Remote Server to 192.168.1.11 (the NAS) and currently 192.168.1.11/514. Log Level has been set to Error and currently Informational. The ERl has been re-started a few times. PS I have another post in Geekzone, because I lose all internet connectivity (sometines) several times a week for approx 30-60 seconds and one of the replies was to provide some logs.